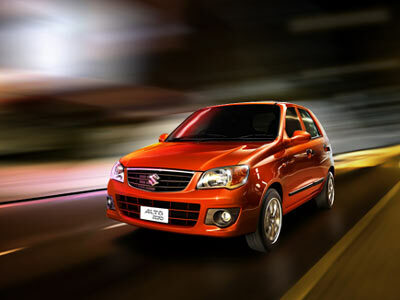 The Alto is one of the fastest-selling and most popular cars in Suzuki's lineup. It's small, diminutive, compact, and is a thousand kinds of adorable. [firstpara] It's not going to do much in terms of being an imagined, metaphorical extension of your manhood. But who thinks of cars as extensions of manhood? Not many folks, apparently; the Alto has been making a big mark in the industry. It's good at what small cars do best: amazing mileage and of course, unparalleled parallel parking-ability. Now, Suzuki Philippines launches a new version of the Alto that's designed to give the model some added oomph, the Alto K10. Prior Alto variants came with an 800-cc engine. With the K10, the Alto finally breaks the one-liter mark, with its K10B 1.0-liter DOHC 12-valve gasoline engine, thereby putting to rest any confusion you might have had about the Alto being nothing more than a motorcycle on four wheels. The engine is the same engine inside the Suzuki Celerio. But while we still would not suggest racing someone on the road with this car, that extra kick in the engine should be a welcome improvement. The other improvements found in the K10 serve to give the little car a little more flair. The new front grille design is noticeably bolder, and is, by leaps and bounds, far less boring than previous offerings. This is definitely a car that's learning a few things in the school of swag, as its fresh, new headlamps and tail lamps would also suggest. Even from behind, it shows a lot more personality with a sportier bumper. Changes have been made to the interior too, and the steering wheel and the shift knob are all the better for it, now looking sportier than ever. Passengers in the back can thank the K10 for the added leg room this model boasts of. Along with those, topgear.com.ph reports that the Suzuki Alto K10 features a new cable-type five speed manual transmission, better suspension, electronic power steering (EPS), front power windows, power door locks, AM/FM CD, MP3 audio system with aux port, full wheel caps, seat belts for all passengers and an engine immobilizer system. Looks like the Alto is growing up right before our very eyes. The Suzuki Alto K10 retails at 439,000 pesos and is available in Silky Silver, Dazzling Red, and Summer Copper Metallic. The car comes with a 3-year/100,000-kilometer warranty.